With different variations of Surface products available, we look at the best options based on your needs. Michael Archambault is a technology writer and digital media specialist. His work has appeared in PetaPixel, Mobile Nations, and BBC World News. Microsoft’s Surface lineup of touchscreen computers was introduced in 2012, launched initially to set new standards for other Windows machine manufacturers. Today, the company has four diverse product lines that aim to address different user needs within the premium device category. Notable has been Microsoft’s vision to introduce different form–factors of machines that they view may pave the way for the future of personal computing. Different designs within the Surface family include hybrid tablets, 2–in–1 notebooks, all–in–one convertible desktops, and more traditional clamshell laptops. With many differentiating features, not only in the way of specifications but how we utilize the devices in our day to day lives, Microsoft’s Surface lineup introduces a plethora of choice. As we move forward into the future, our view of the PC may be transformed, but what form factor is best for your needs? 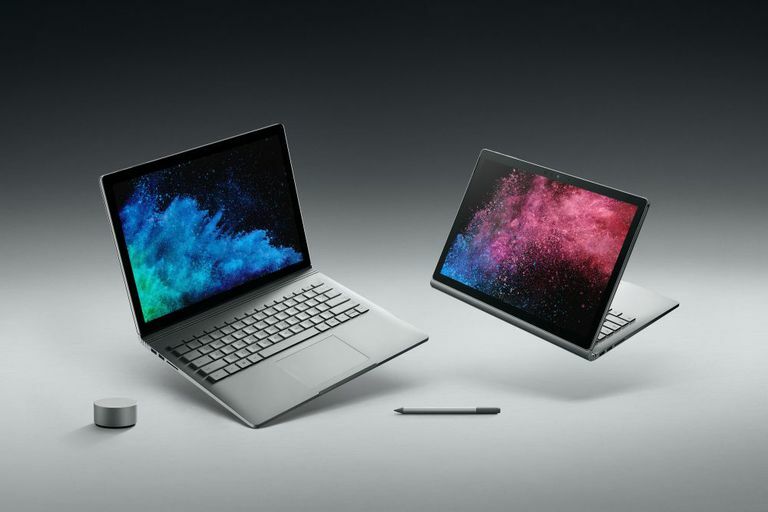 Microsoft’s Surface Book lineup has placed its focus on the 2–in–1 detachable notebook form–factor. What appears to be a typical 13.5 in or 15 in notebook is instantly transformed with the click of a button, allowing the screen of the device to be pulled off and used as a tablet. Users can also take advantage of docking the tablet back into the keyboard in reverse position to take advantage of a longer battery life of up to 17 Hours. The Surface Book does award itself the position of being Microsoft’s heaviest portable device at 4.2 pounds for the larger 15 in variation with the keyboard attachment. Coming into play with the most powerful internal specifications out of any of the Surface products, the Surface Book 2 is ideal for those who either prefer the more typical laptop form factor with an option to break away a tablet, or those who will need to take advantage of the system’s processing capabilities and VR capable Nvidia GeForce GTX 1050 or 1060 graphics processors. Surface Pen Support: Both systems fully support the use of Microsoft’s Surface Pen, allowing for 4096 levels of pressure and 1024 levels of tilt detection. Port Selection Includes: 1 USB–C port, 2 USB–A ports, full–size SDXC card reader, 3.5mm headset jack, 2 Surface Connectors. Windows Hello: Sign–in to your PC with a glance of your face thanks to the units’ front facing 5.0 MP 1080p camera. The unit also sports an 8.0 MP 1080p rear–facing camera with autofocus. Detachable Dock: Easily switch between a notebook computer and a tablet with Microsoft’s patented hinge solution. Microsoft’s Surface Laptop will be the most familiar of design choices to consumers as it is merely a standard clamshell notebook design–no detachable displays or removable keyboards on this model. Designed in mind to be ultra–light and portable the unit achieves its goal with an overall weight of only 1.69 pounds and an impressive 14.5–hour battery. Comparing Microsoft’s Surface lineup, the Laptop is positioned as an excellent choice college students or other individuals who prefer the more conventional laptop design, and don’t have the need to utilize a stylus in their work. With a healthy selection of processors, storage devices, and memory allotments, the thin and light laptop can handle much thrown its way. However, graphics–heavy applications may fall short due to the system only offering integrated Intel graphics. Color Choices: Available in four different colors including: burgundy, platinum, cobalt blue, and graphite gold. Alcantara: Palm–rest and keyboard surroundings are covered in spill resistant, soft Alcantara fabric material. Port Selection Includes: 1 USB–A port, 1 mini DisplayPort, 3.5mm headset jack,1 Surface Connector. Windows Hello: Sign–in to your PC with a glance of your face thanks to the unit’s front–facing 720p HD camera. The Surface Pro was one of the original devices to kick off Microsoft’s lineup of consumer personal computers back in 2012. To this day, the company’s vision has continued forward with welcomed improvements and tweaks to the overall design. Surface Pro is effectively a tablet PC that can be supplemented with an external keyboard known as the Type Cover. Using the machine’s built–in kickstand, user’s can quickly switch between holding a lightweight tablet or sitting down at a desk with a full–sized physical keyboard. Compatible with the Surface Pen, Microsoft’s Surface Pro device is an excellent choice for those looking for a full Windows 10 tablet with the ability to jot down notes or conjure up beautiful works of hand–drawn art. With the ability to pack in a Core i7 CPU, 16 GB of RAM, and a 1TB SSD don’t let this tablet fool you–it is a full–blown Windows computer ready to perform even some of the most intense computational tasks. Only don’t expect too much graphics performance from the units limited integrated Intel graphics. Port Selection Includes: 1 USB–A port, 1 microSDXC card reader, 1 mini DisplayPort, a 3.5mm headset jack, and a Surface Connector. Type Cover: Microsoft’s physical keyboard add–on for the Surface Pro is a much–needed addition for productivity and comes in three signature colors: Burgundy, cobalt blue, and platinum. Optional Cellular: Go mobile with the Surface Pro’s optional 4G LTE cellular radio to access an internet connection anywhere you have a cell signal. Storage: 64 GB SSD with 1 TB HDD, 128 GB SSD with 1 TB HDD, or 128 GB SSD with 2 TB HDD. While Microsoft had aimed their Surface lineup at mobile computing, a new desktop addition was introduced in 2016. The massive 28 in all–in–one desktop is set upon what Microsoft calls a ‘Zero Gravity Hinge’ and can effortlessly float between being propped up for daily use or laid flat down on the desk for use with the Surface Pen. Wholly aimed at creative professionals, the Surface Studio is aimed at individuals who are looking for the most powerful machine in the Surface lineup with an immensely beautiful touchscreen display to match. The high price tag of the machine doesn’t limit the machines on specs with a top–end model featuring an Intel Quad–Core i7 CPU, 32 GB of RAM, and an Nvidia GeForce GTX 980M. However, it is worth noting that the unit’s processor is an older 6th generation processor that was introduced over three years ago. The Surface Studio does offer impressive storage with hybrid design drives, but some may find them underwhelming when compared to standard SSD drives–especially at this machine’s price point. Out of the box, the Surface Studio includes the unit itself, as well as a Surface Pen, Surface Keyboard, and Surface Mouse; this is out of line with any other of the machines which do not include the Pen in the box and must be added as a separate purchase. Port Selection Includes: 4 USB–A ports, 1 full–size SDXC card reader, 1 Mini DisplayPort, a 3.5mm headset jack, and 1 Gigabit Ethernet port. Windows Hello: Sign–in to your PC with a glance of your face thanks to the units’ front facing 5.0 MP 1080p camera. Surface Dial: On–screen support for Microsoft’s Surface Dial accessory, allowing for physical control onto of the screen itself. PixelSense Display: The true beauty of the machine is the unit’s ultra–thin 28 in display with 10–bit color depth and 13.5 million total pixels surrounded by an aluminum frame. The Microsoft Surface 3 vs the Surface Pro 3: What's the Difference?